Nut appears in the creation myth of Heliopolis which involves several goddesses who play important roles: Tefnut (Tefenet) is a personification of moisture, who mated with Shu (Air) and then gave birth to Sky as the goddess Nut, who mated with her brother Earth, as Geb. From the union of Geb and Nut came, among others, the most popular of Egyptian goddesses, Isis, the mother of Horus, whose story is central to that of her brother-husband, the resurrection god Osiris. Osiris is killed by his brother Set and scattered over the Earth in 14 pieces which Isis gathers up and puts back together. Osiris then climbs a ladder into his mother Nut for safety and eventually becomes king of the dead. A huge cult developed about Osiris that lasted well into Roman times. Isis was her husband's queen in the underworld and the theological basis for the role of the queen on earth. It can be said that she was a version of the great goddess Hathor. Like Hathor she not only had death and rebirth associations, but was the protector of children and the goddess of childbirth. - Coverer of the Sky: Nut was said to be covered in stars touching the different points of her body. - She Who Protects: Among her jobs was to envelop and protect Ra, the sun god. - She Who Holds a Thousand Souls: Because of her role in the re-birthing of Ra every morning and in her son Osiris's resurrection, Nut became a key god in many of the myths about the after-life. Nut is also the barrier separating the forces of chaos from the ordered cosmos in the world. She was pictured as a woman arched on her toes and fingertips over the earth; her body portrayed as a star-filled sky. Nut’s fingers and toes were believed to touch the four cardinal points or directions of north, south, east, and west. “Hail, thou Sycamore Tree of the Goddess Nut! Give me of the water and of the air which is in thee. I embrace that throne which is in Unu, and I keep guard over the Egg of Nekek-ur. It flourisheth, and I flourish; it liveth, and I live; it snuffeth the air, and I snuff the air, I the Osiris Ani, whose word is truth, in peace. 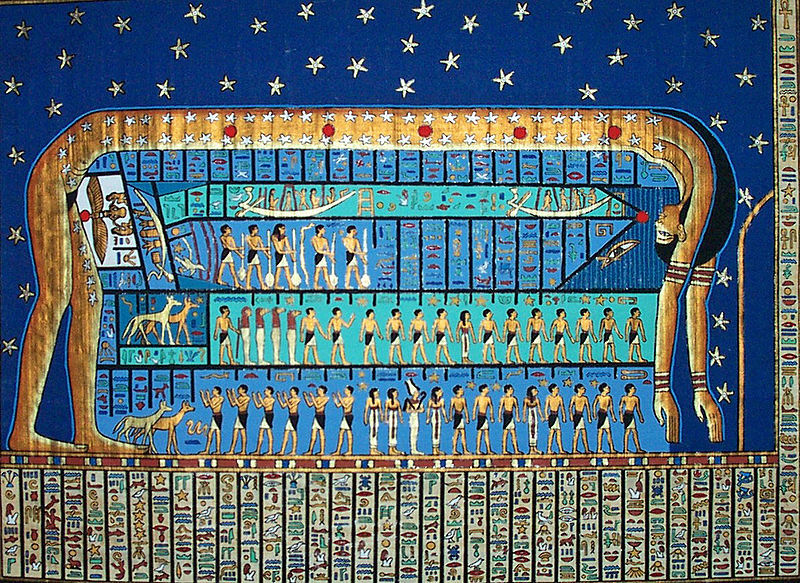 A sacred symbol of Nut was the ladder, used by Osiris to enter her heavenly skies. This ladder-symbol was called maqet and was placed in tombs to protect the deceased, and to invoke the aid of the deity of the dead. Nut is considered an enigma in the world of mythology because she is direct contrast to most other mythologies, which usually evolve into a sky father associated with an earth mother or Mother Nature.